In the past, I've played around with making raw carrot ribbon salads, especially when colorful heirloom carrots are around, but I wanted to try something a little different that varied in texture and packed a lot of flavor. By those measures, this recipe is a success. Instead of leaving the carrots raw like I would usually prepare them, I lightly cooked and glazed them so that they became soft, pasta like ribbons. 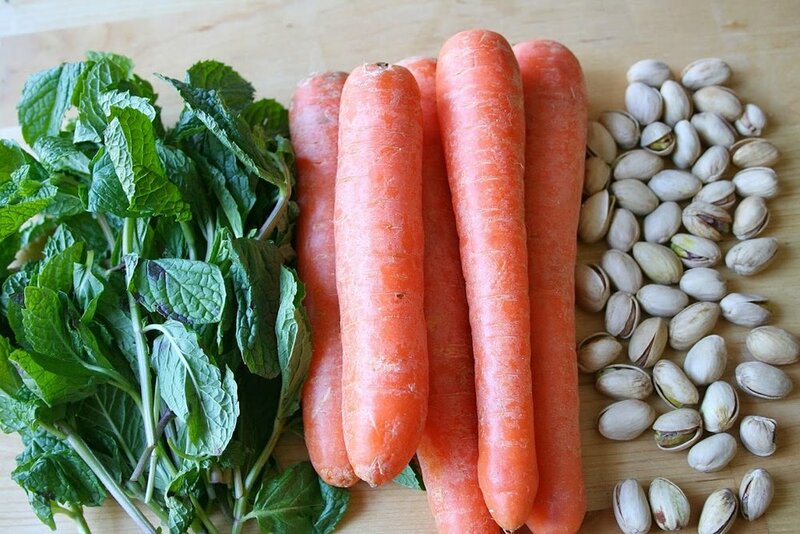 And while traditional pesto would have worked fine, I chose pistachios, which like carrots have a natural sweetness to them, and mint because I love it and it's a nice departure from basil, especially in spring. When you take a bite, you are immediately hit with the intense sweetness of the soft carrots followed by the more savory brightness of the crunchy pesto. It makes for lovely weekend lunch or a side dish at dinner. The pesto itself can be used in a ton of ways - with regular pasta, smeared over some crusty crostini, or spooned over grilled meat - I'm planning to use my leftovers as the perfect compliment to some lamb kabobs later this weekend. Using a vegetable peeler, shave all of the carrots until you have a pile of ribbons. In a large sautee pan, bring the orange juice and brown sugar to a boil and let it cook until it thickens and reduces by half. Add the carrot ribbons and the butter and cook until almost all the liquid is absorbed. While the carrots cook, prepare the pesto by pulsing all the ingredients in a food processor or blender until they become a paste. I like to leave mine a little bit chunky, but you can add more or less oil depending on the consistency you like. When the carrots are ready, remove from the heat and add the honey, balsamic vinegar and salt and pepper.